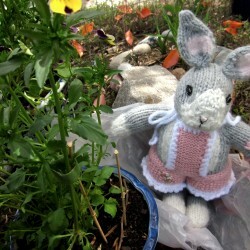 I was so excited when I saw the two new arrivals to the Bunny Garden; the first this Spring. 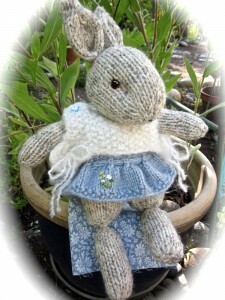 They’re a continuation of the ongoing evolution of my hand knit bunny creations that began a little over a year ago. 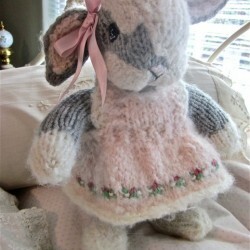 Each bunny is one-of-a-kind & I never know who he or she is until they’re totally finished. I’m always excited to see who emerges from the crossing of two needles and a ball of yarn. That’s an example of the way my bunnies are constantly changing & evolving. I hadn’t planned on putting Olivia’s ears low on her head when I began to knit her. Each bunny is determined more by the shape of their head than anything else. 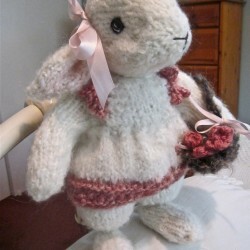 For some reason I don’t understand, every time I knit a new bunny their head shape ends up being different than any of the others that I’ve knit- even though I do the same things when knitting them. 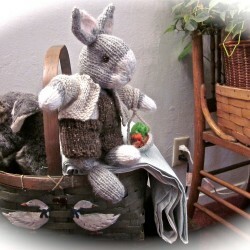 Once I see the head shape that I’m going to be working with, ideas start coming to mind, guiding me on how to best sculpt the head and stitch the facial features; my goal being to create a bunny that embodies the unique irresistible nature of live bunnies that I’ve known and loved so much over the years. 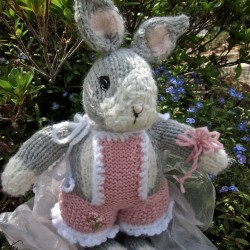 Finished just yesterday, Rebecca is the second of the new Spring bunnies to the garden this year. You can see the difference in head shapes, between Olivia’s, pictured above, and Rebecca’s, (to the left.) Rebecca’s head has a shorter, rounder shape than Olivia’s did. With Rebecca, I again experimented with the placement of her ears. I also tried to fill her little cheeks out a bit to go with her more rounded head shape, the way real bunny’s cheeks appear. I once had a Netherlands Dwarf bunny that Rebecca’s more compact, rounded face shape reminds me of. Soon I’ll be ready to begin another bunny. I’m curious to see what my next attempt with the needles is going to produce. I wonder~ could this be the way a “real” bunny mom feels? Perhaps I’ve discovered the reason bunnies have such large families; they simply can’t wait to see who’s coming next-? 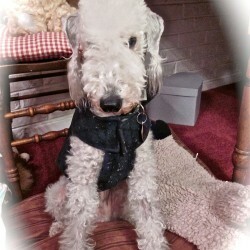 Pascal, my previous bedlington terrier did this, but it wasn’t until I saw Pippin do it that the nickname “Hoover”popped into my head- and stuck on Pippin! Seriously; he does this every time we go on a walk, which is to say, daily. Usually he’s on a lawn when he decides to “hoover”. His head goes down and he starts sniffing the grass. In a split second he’s off! 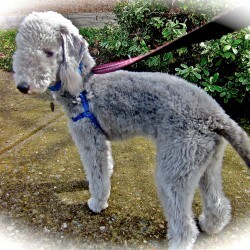 His legs follow his nose in a line, his head bob-bobbing mechanically up and down like a child’s pull toy. Watching Pippin and laughing this morning as he did this, for a split second in my mind, his body transformed into a vacuum cleaner. That’s it! I thought watching him, his nose lured along an invisible line; the intrigue of a new scent. 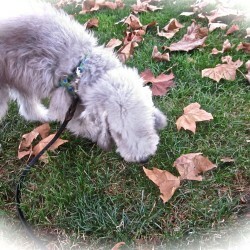 Obviously on a mission, with his nose sniff-sniffing and his head down; he was not to be side-tracked by anything. After what seemed more like forever than the 30 minutes it actually was, we arrived at the warehouse-like cargo site of Delta airlines. It appeared deserted. There was one man standing out in front looking for us. It seems we were given the wrong arrival time and poor Pippin had been waiting in his little crate for a half hour already. He was the last of the cargo to be picked up. 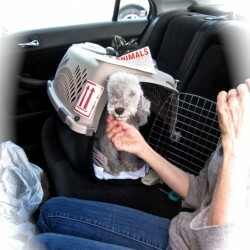 I ran over to the crate that held him to look inside~ My heart absolutely melted seeing him sitting there, calmly looking back at me, probably thinking, Who is she, and where am I, I want to go home! I wanted so much to hold him and hug him tight and tell him he was going to be fine. I loaded Pippin in his crate into the back seat of the car then climbed in next to him and opened the door to his crate so he could come out. Curious, he’d take a few steps towards the front of the crate, but then quickly retreat. I put a little of his kibble in my hand and offered it to him. That got him to come forward again but only for a few secs and then he backed up. It took a little while before I was able to coax him out of his crate, but finally he came out. 2014~ A New Year~ New beginnings….! And here comes Lamb Dog #2! It’s been awhile since my last post, but in my last post I wrote about the goings on in my Bunny Garden. 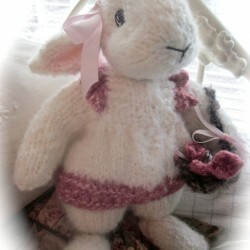 I have continued making bunnies for the garden and over the past several months, little lambs have come to join them. The little guy pictured here is Wooliam. 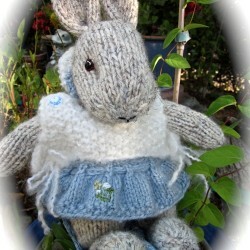 He is the result of my own design and experimentation with combining knitting and embroidery. Wooliam’s head consists of two days of embroidering individual layers of French knots over his knit head- a painstaking job, but one with very pleasing results. 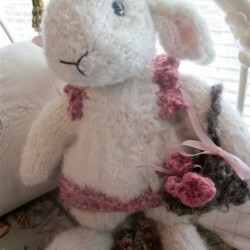 I wanted to make a knit lamb that had the gentle warmth and loveable quality that’s commonly associated with lambs.~ More on the happenings in the bunny garden in my next post! Aha! I managed to convince a few of the bunnies to hold still long enough for me to snap their picture! It’s been so long since I’ve written that I thought today I would try to update my blog. I was surprised to find that even though it’s been so long since I’ve last posted, I’m still working on the same thing; knitting bunnies! 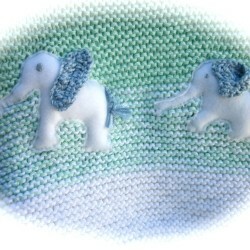 When I last wrote, I had just finished knitting the first few that I’d ever knit. 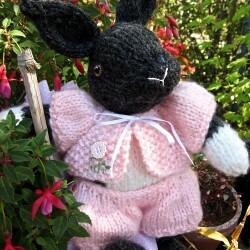 To date, I’ve knit 16 ~ and just started on my 17th bunny! They are all one-of-a-kind and as you may be able to tell from the photos I’ll post; each has his/her own very distinct personality. I love knitting them and get so excited as I get close to completing one, because even I don’t know who they are or what personalities they have, until they’re totally finished. More than once, I’ve stayed up all night working because I was close to completion and couldn’t wait until morning to find out who it was. The bunnies, as I’m sure you’ll notice if you look at pictures of the first ones I made, (see previous post,) have been gradually evolving. In creating them, my desire is to capture what I find most dear about rabbits and try to convey that essence in the bunny that I’m making. It’s definitely a challenge! The one thing that seems to really define the bunny, and make one bunny different from another, is it’s head shape and the size and shape of it’s facial features. When I say that they have evolved from the first few that I made, I’m referring to things about their heads and faces. With each bunny that I make now, I’m sculpting their heads to make them closer to the shape of a real bunny. I have no pattern telling me how to do this it’s done purely by how I perceive it to be. The same is true with stitching the facial features: it’s a process mostly of trial and error, based purely on my perception at the moment~ about as far from an exact science as it could be and that’s what makes it so difficult to do. Everywhere I look I see Spring! If Spring were a flavor, it would most definitely be sweet. Think about it. ~ The spring trees are abloom in cotton candy shades of pink and white that hug their branches like puffs of spun sugar. 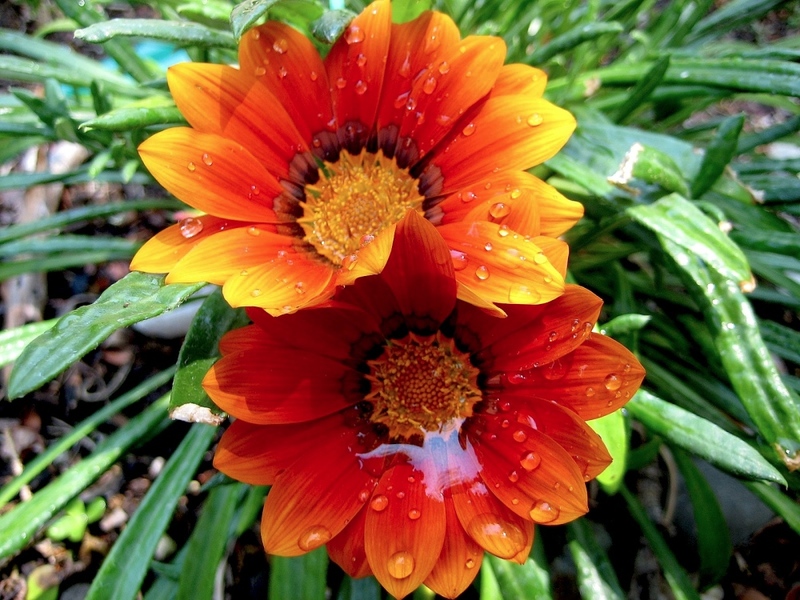 The spring sky is unpredictable; one minute sun, the next- showers. The clouds pulling sun minutes into shower minutes are the puffy billowy kind; marshmallow clouds. Sweet again! Spring is also about babies~ and all babies are sweet. Spring simply is~ Sweet! Spring has definitely come to the bunny garden! Aahh~ take a deep breath. What do you get? Sweet! The air is intoxicatingly sweet with the scent of Freesia. Looking out over the garden I see bunnies hopping every which way, heels so high in the air it seems they’d pull a bunny right over in a back flip! Like Spring, bunnies are sweet and Spring is bringing new bunnies to the garden.Looking out over the garden I can tell the bunnies are extra excited. They’ve discovered the crop of new spring greens, always the sweetest of the year. 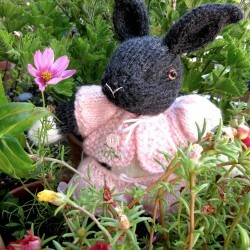 A pretty, large, pink flower suddenly hopped into the air with the bunnies. Wait! A hopping flower?? I looked closely before realizing that what I’d been staring at and thinking was a newly opened flower, wasn’t a flower at all, it was a new bunny!!! This little one kicked her heels higher into the air than the other bunnies & because she happened to be in front of a tree, she looked just like one of the tree’s pink blossoms. No question about her name. 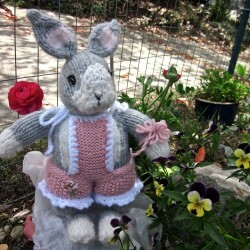 This was Peony, the sweetest little flower bunny; Sweet as Spring, Sweet as a marshmallow cloud, Sweet as the flower-scented air- Sweet—– as a bunny! 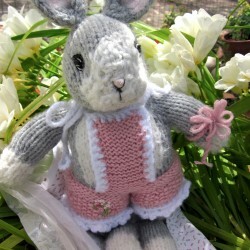 Peony is the newest bunny in the garden, and Peony is a genuine baby bunny, Springtime Sweet as Sweet can be!! July/August~ Needles and the Bunny! Bunnies, bunnies and more bunnies!! Taking a little break from making handsmocked & embroidered dresses, I’ve spent the past few months knitting; one of my favorite things of all, to do. I first learned to knit when I was 12; my teacher was my 13-yr.-old friend who was very gifted & knew how to do more than most adults did. 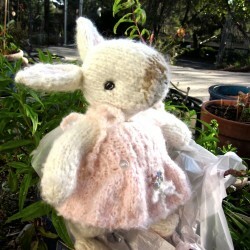 I think of her with gratitude every time I pick up my knitting needles. I never would have imagined when I first held a pair of needles in my hands that knitting would become the much-loved activity in my life that it very quickly became. I’ve truly enjoyed the past two months that I’ve devoted to knitting! 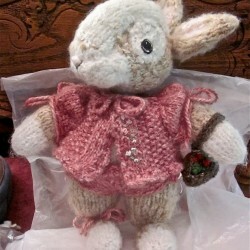 I started a few months ago knitting a bunny from a Debi Birkin pattern that I found in an Etsy shop and fell in love with. 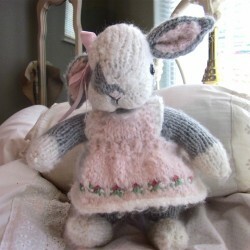 This was the first time in all of the years that I’ve spent knitting, that I knit a bunny doll. I loved doing it! 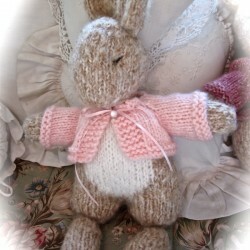 I loved knitting the little bunny so much that I had to knit another right away. 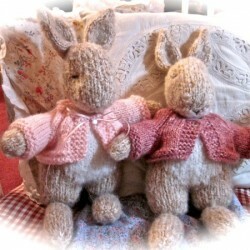 To date I have knit several bunnies, each one different. It’s always a wonderful surprise to see the unique personality that emerges with each new bunny. 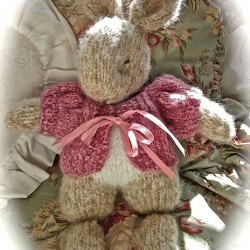 After knitting the first bunny I started experimenting, making changes to the pattern; molding it to get the “look” that I’m after. I have always loved bunnies. Over the span of several years, I had 4 house bunnies; all very sweet and very special. I loved to study their faces. There is a special & unique sweetness that even the mischievous ones had. 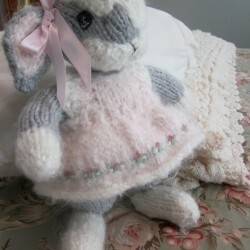 It is that special “sweet” look, so unique to bunnies, that I’m trying to capture in the faces of the bunnies that I knit. 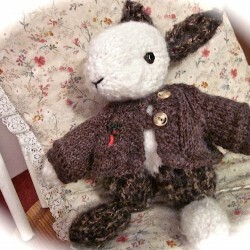 The bunnies aren’t at all easy to make, in fact I find them more difficult than any sweater I’ve made. It’s not the knitting itself that’s difficult, it’s the assembly; particularly the heads & faces. 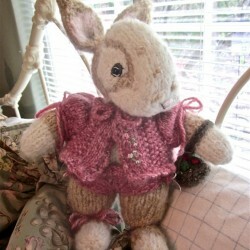 To capture the bunny look that I want, requires much more than knitting an oval, bunny-shaped head. I start with that knit shape, but then I need to put a lot of filling into it so that it’s very firmly stuffed so that I can squeeze the face to make indents where the eyes belong and make it pouffe-out in the cheeks and over the mouth. Once I squeeze an area to be the way I want it, I have to stitch through the head from one side to the other; back & forth, to hold the shape permanently. Sculpting the face in this manner is a slow, difficult process, but one that I love doing, as this is where the bunny is formed as an individual. This is where its personality emerges. Once the head and face are shaped the way I want them to be, I hand stitch with embroidery floss, the eyes, nose & mouth. Work on just the head/face alone, is very intense and takes several hours. This is the part that I find the most difficult in making the bunny~ but it is also the most fulfilling. 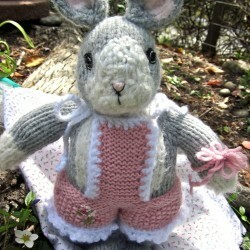 Once I’ve created a bunny, it’s time to knit something for them to wear. Usually I haven’t an idea what it will be until I’ve created them & seen what their personality is. 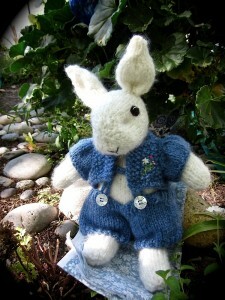 For the first few bunnies, I knit sweaters, but as I knit more bunnies I felt like it would be fun to knit whole outfits for some of them, so my more recent bunnies are dressed in coordinating outfits; sweaters & pants or sweaters & a skirt- or overalls. 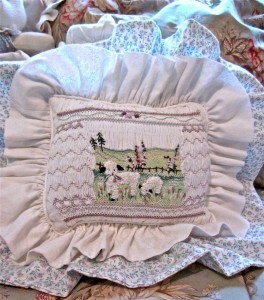 I like to hand embroider a little flower~ or vegetable, on their clothes, it’s sort of become my signature. 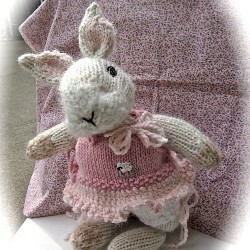 I will definitely continue with bunny-making in the future, as they’ve become one of my very favorite things to knit. 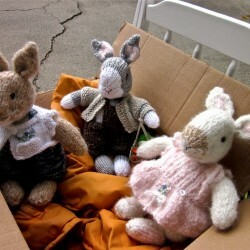 I also knit lamb dolls and have a few patterns of some new animals I’d like to try; an elephant, a mouse, and a puppy, so keep checking back and you may see these in my shop soon. In addition to my animal menagerie, I’ve knit a few baby poncho & pants outfits that I enjoyed knitting and I just started a new outfit, so it should be in my shop, in about a week. And THAT’S what I’ve been up to!!! August has started off to be horribly hot. I’m really hoping that this isn’t an indication of the remainder of the month. I’m trying to keep in mind that Fall, my favorite season of the year, is just around the corner~ Trying to knit on a hot day can be a challenge. 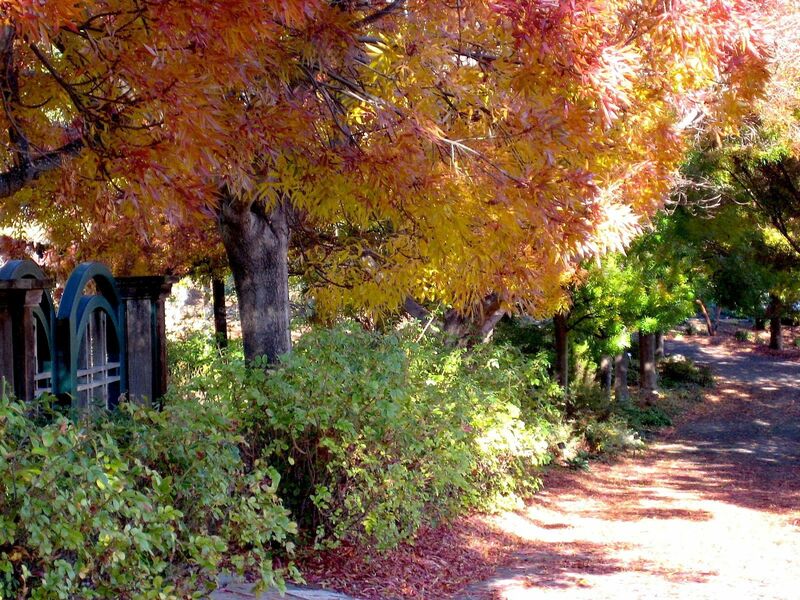 I find if I imagine Fall outside, with it’s wonderful crisp, refreshing air and brilliantly colored leaves that ride a breeze with the grace of a surfer riding a huge rolling wave, I can almost forget about the 100` plus temperatures outside. Almost! I hope you’re enjoying your summer and are able to stay cool! It’s hard to believe it’s summer already. I feel as if I’ve just taken a giant leap into June from January, 2012. The past several months have been very busy, presenting surprises, not all of them welcome- but also, lots of exciting and challenging projects for me to try. You may have noticed my website was down for a while~ that’s because it got hacked. A lot of work on my son’s part, set me up with a new website. Unfortunately, I’m having problems uploading my photos onto the site. A listing with no photos, doesn’t work- but my items, (currently 96 products,) can always be found here, at my Etsy shop. Please come and take a look and as soon as I’m able to get my website working smoothly, I’ll let you know with a new blog post. I’m hopeful it will be soon! I learned to knit when I was 12 from a good friend whom, it seemed, could do everything. She was 13! Little did I realize then, how invaluable her teachings would become. I have now been knitting for most of my life and it’s absolutely at the top of my list of favorite things to do. 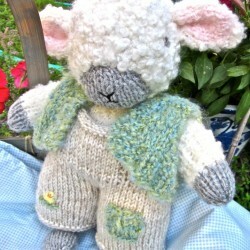 I’m excited to try some new patterns that I got for some knit animals that will join the lambs and bunnies, of which I now have several, in my shop. Currently I’m in the process of completing a little knit outfit, size 12mos., consisting of hand knit long pants & a little hand knit poncho, so that will be the next new item you’ll see in my shop~ as well as in my blog. 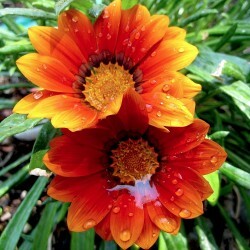 I hope you are enjoying summer, with it’s beautiful flowers and long, carefree days. I hope to be back soon with news that my website is fully working- and with lots of new listings for you to see~ Until then, Enjoy! Wouldn’t it be nice to have an extra set of arms & hands? So many times I find myself wishing for that. I could accomplish twice as much as I do now. That would be wonderful! It’s been a long time since I’ve written~ too long! I feel bad about it. It’s not that I haven’t wanted to write, I’ve just been so busy with my work. Unfortunately I’m not one of those people who are good multi-taskers. There are so many things I’d love to make, but they all require a lot of time. In the interest of trying to get more items made, I decided to concentrate my efforts for a while~ and that’s why I haven’t been here. There is still so much that I want to make, so I can’t commit to a regular writing schedule , as I hope to be able to do someday, but I intend to pop in more frequently and let you see some of the things I’ve been working on. Just before beginning work on the order for the Christmas dress I made a dress for my shop that is my personal favorite. When shopping for fabrics, I like to buy cuts of whatever I see that I think would make a nice dress- without having any particular dress in mind. I bring them home, wash them & put them away until I’m ready to begin a new dress. That way I build an adequate supply of fabrics so that when I’m ready to start a dress, I can look at them & choose whatever I’m in the mood to work on. The fabric for this dress is fabric that I’ve had longer than any of my other fabrics. Every time I went to choose fabric for a new dress I’d pass this one over~ it just never seemed to “grab” me~ until recently. I think I even surprised myself when I opened the cupboard where I keep my fabrics, spotted this and said, “Yes!” I never would have guessed that it would turn out to be my very favorite dress, but that’s exactly what happened. 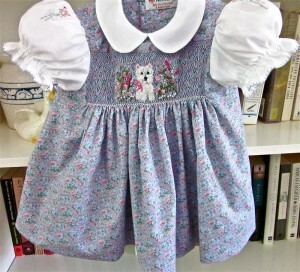 Once I saw the fabric I knew exactly how I wanted the dress to look. 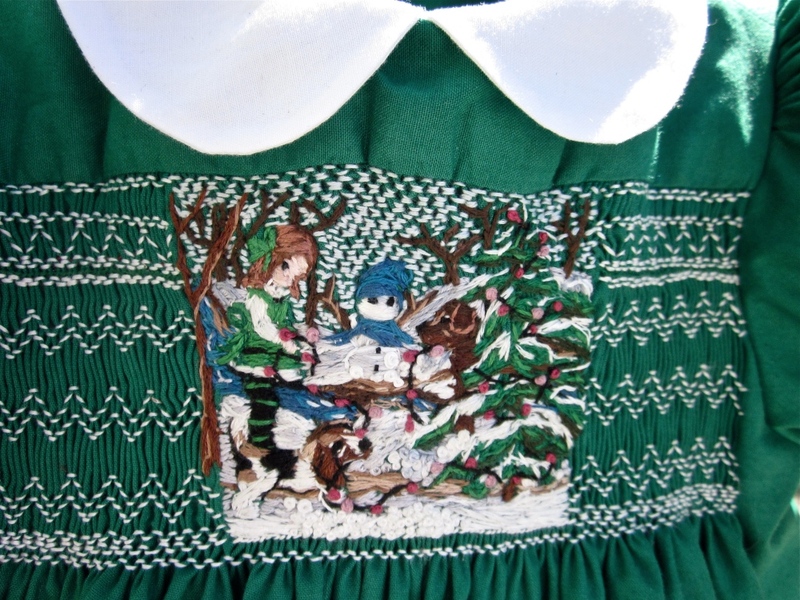 It’s always a bit scary to me to combine fabrics as I’ve done here, with the collar & sleeves in white and the body of the dress in a small print, giving the dress a “jumper & blouse” look. It’s difficult to visualize which fabrics will look good in that style & which won’t. It’s definitely not fit for every print. This is only the second time that I’ve tried embroidering on the “puff” part of each sleeve, but I really like the way it ties the print of the fabric together with the white sleeves, although it’s not an easy thing to do. In fact it’s very difficult to embroider from inside the small area that is available in the sleeve of a baby dress, but I think it’s worth the effort and contributes to creating a dress that’s both unique and very special. These are just a few of the things that have kept me busy in recent months. I’ve also been knitting, as I’m trying to build a supply of knit items for my shops as well, but more on that in my next post. I’m working on a new dress right now and I’m close to being finished embroidering the scene. I’m looking forward to getting to the part where the dress gets sewn together. I’m sorry to say that my sewing machine which has served me so well over the past 25 yrs. has finally said, “enough!” It’s replacement is sitting, still in it’s box, waiting for me to reach the stage where it will be needed. I’m anxious to see how it will work. Hopefully I’ll love it as much as I’ve loved my old machine and, (whisper-) maybe even a bit more! I’ll let you know how I like it, next time I write~ must return to work now! 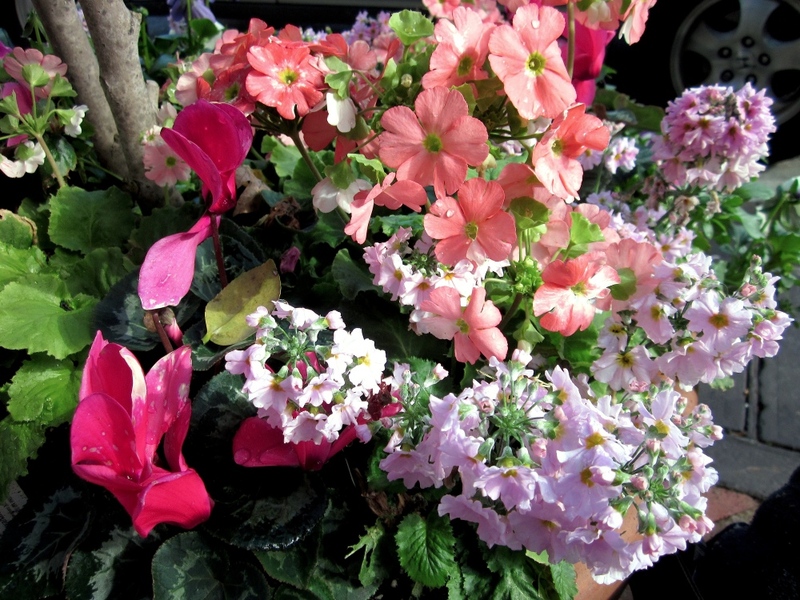 I hope you enjoy the beautiful fall weather that’s either just arrived- or will be arriving soon! Fall is my favorite season, so I’m looking forward to cool, beautiful days! What a difference in a weeks time! Not a speck of fog this morning when Pascal and I left the house! According to my computer the temperature was 53`. I still needed my jacket ~ over a sweater & a sweatshirt, but the air was noticeably warmer than it was earlier in the week. We haven’t been to Heather Farms in a few months. In the winter when it rains it gets too muddy. Besides being muddy, it’s not the best time to go, as most of the geese and the ducks have gone elsewhere, and hardly any of the plants in the gardens are blooming- buts that’s Winter. 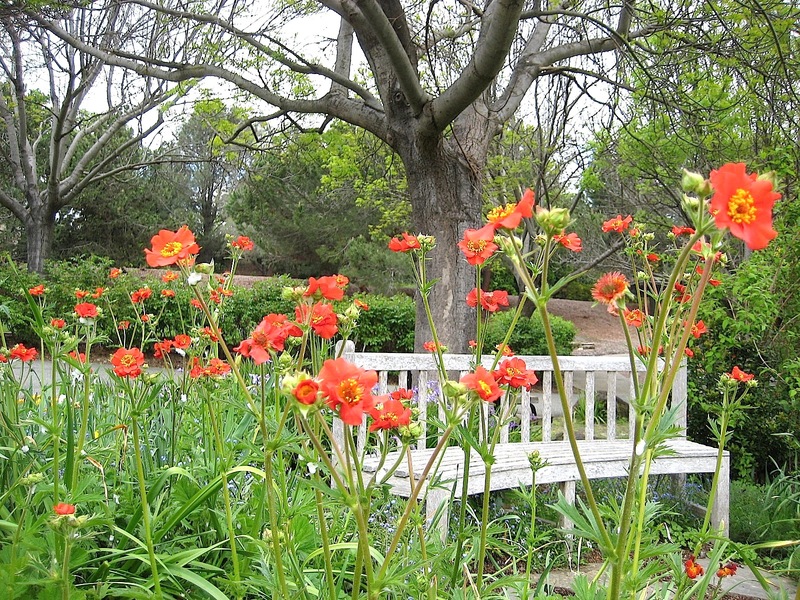 Springtime at Heather Farms is always spectacular, and an ideal place to bring the camera. 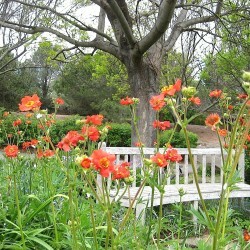 I am so looking forward to getting new photos for my notecards- Hmmmmm- it’s really NOT actually spring yet. But it FEELS like spring. I look over at Pascal who’s looking out the window of the car. 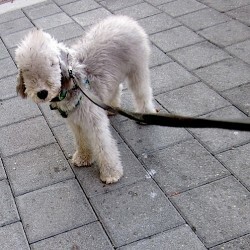 Do I turn left & go to town for a walk, or do I turn right and head for Heather Farms~? I really, really, don’t want Pascal to get muddy. But it’s been two weeks since we’ve had rain. How muddy could it be now? I turn right. We’re going to Heather Farms!! 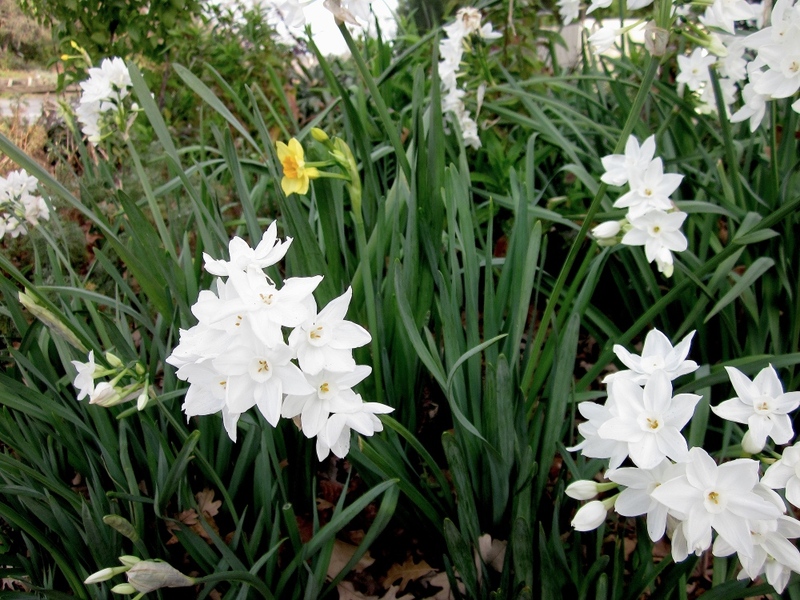 We have about a 20 minute walk down a paved road before we actually get to Heather Farms and I’m happy to see along the way that there are several clusters of paperwhites ~ and even a few early daffodils, in full bloom; Spring was in the air! Arriving at the path to Heather Farms we stood at the top of the hill for a few minutes, surveying the fields and the canal below us ~ The crisp early- morning air seemed so still~ and so quiet! The ground definitely was still wet, but if didn’t look too muddy. Okay, Pascal! Let’s go! 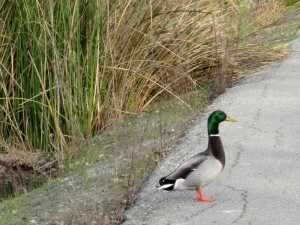 We had just barely started down the hill when I heard the familiar sound of geese squabbling. All right! Surly I’d get some pictures today! Rounding the curve in the path, we arrived at a clearing beside the pond that the geese & ducks have made their beach. 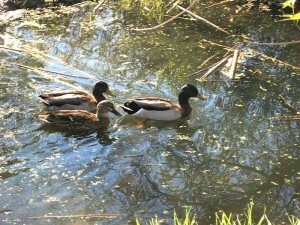 This morning, with the exception of the ducks swimming in the canal, the pond appeared empty. But the beach was packed~ packed with geese! Mating season must have begun. The beach reverberated with squawking, reminding me of a political convention. 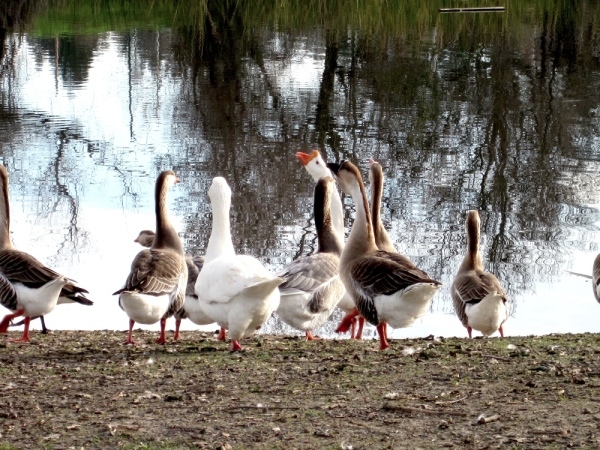 One goose would get right into another’s face, squawking & nipping with wings extended, until the other goose backed away. We stopped to watch “the show” for a few minutes. I was anxious thinking that Pascal would bark at them and disrupt everything, but he didn’t make a sound; in fact, he looked bored~ so after taking a few quick pictures, we moved on. On the opposite side of the path, just a bit beyond the noisy beach, it was quiet except for the light sound of water splashing. The canal at this point, was overgrown with reeds so at first I didn’t notice the pair of mallard ducks floating among them. Getting closer I saw a large white shape- Excited, I reached for my camera. At first it was hard to tell what I was looking at, as all I could see were two stick-like, long legs extending from a large, white, headless body- The head was buried under the water, but I had an idea of what it was. Last fall I was lucky enough to come across a beautiful, graceful bird, the Snowy Egret. Standing alone on the beach that today was populated with geese, it looked so elegant & magnificent set against the backdrop of trees in their fiery red orange & yellow, fall-leaf attire. This, I discovered, was the origin of the splashing sounds I was hearing. 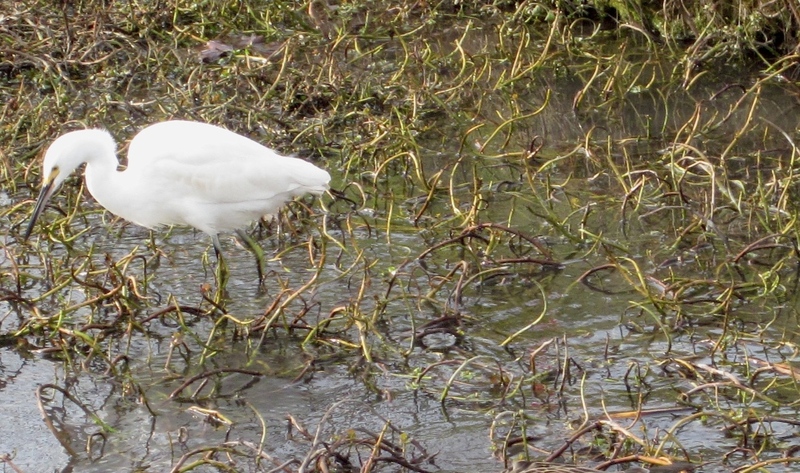 When the egret lifted his head from the water, he started a strange sort of stamping “dance” in the reeds. 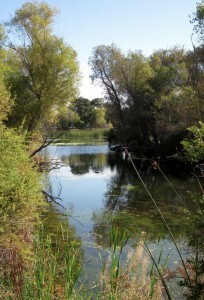 With one of his large feet he’d stamp the reeds continuously, now & then submersing his head below the water. The stamping must have been a way to make insects, or whatever he was eating that was in the reeds, come out so he could catch catch them in his mouth! I took several pictures of him but he seemed to be in constant motion so it was difficult to get a good one. 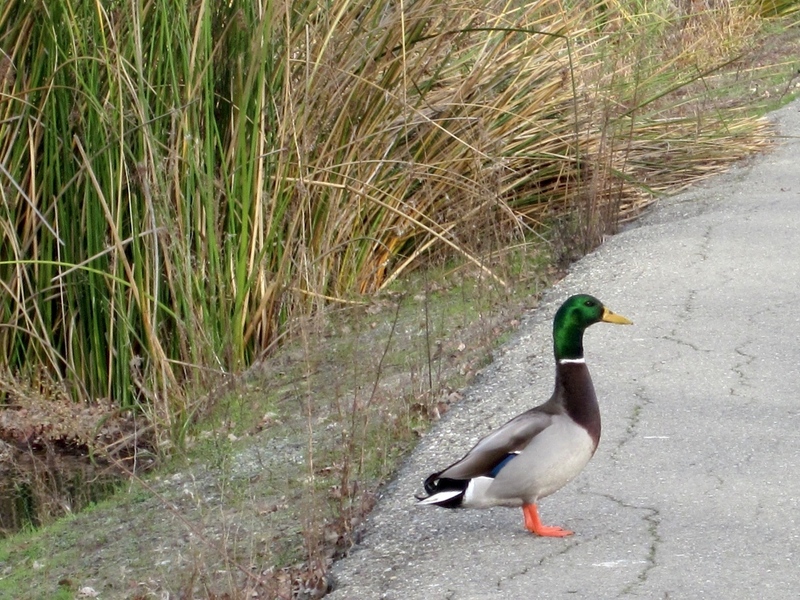 I feel rewarded to have finally gotten this one good picture of him~ We walked just a bit further down the path , and there, standing directly in front of us was a beautiful mallard duck. He stood very still as if he were posing. “Click” – gottcha! It may not have quite been Spring yet, but it was definitely in the air! I’m excited to add these new photos to my growing collection for new notecard sets to be added to my shops soon. Last week was a busy one, but I was able to complete and list my fifth lamb, Amelie~ and I listed two new sets of note cards, Glistening Orange, and Bench of Poppies. 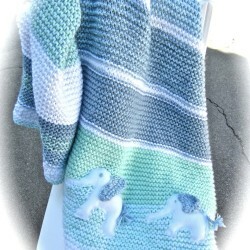 I’m currently still working on the baby blanket I’m knitting for my grandson who turns 1 this week. I haven’t worked on a dress since before Christmas. I thought it would be a nice break to work on my knitting and notecards and while I love doing both of those, I hadn’t realized until a few days ago, how much I miss working on my dresses, so this afternoon, guess what I did! I cut out a new dress! All that I know right now is that it will be a size 2 and it’s a beautiful shade of light, light, pink. Mainly I need to concentrate on finishing the blanket, but if I have a dress all pleated; ready to smock & embroider, I may just be able to work on it a bit this week too. I’ll let you know~ Have a great week!